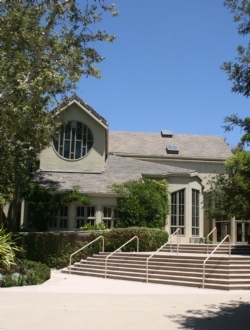 The Parish of St. Matthew was conceived and nurtured by the efforts of a group of lay people in Pacific Palisades, and came into existence officially on October 5, 1941, when the first service was held in the library building of the Presbyterian Conference Grounds, then located north of Sunset Boulevard at Temescal Canyon Road. When the library was no longer available, services were held in a parishioner's studio, and at one time a tent was considered. The first Church building was at the corner of Swarthmore and La Cruz in Pacific Palisades. The first service in the new Church was a wedding on June 26, 1942. The first Sunday service was on June 28, 1942. The first vicar was The Reverend Kenneth Worthington Cary, who arrived in February of 1944. When the mission became a Parish on January 24, 1945 he was elected rector and served until 1978. Father Cary was succeeded by The Reverend Arnold A. Fenton, The Reverend George Six, The Reverend Canon David Walton Miller, The Reverend Howard Anderson, and the present Rector, The Reverend Bruce A. Freeman. St. Matthew's Preschool was started on May 2, 1949 and the St. Matthew's Parish Day School began on September 12, 1950 at the Swarthmore location. On March 27, 1951 a deposit was made on the 74 acre Garland Estate, 42 acres on which the present Parish is located. The original Church was cut in half, moved up Sunset Boulevard to the new location, remodeled and enlarged and the first service there was on March 15, 1953. On October 23, 1978 the Church, along with 86 homes, was destroyed by fire. On June 14, 1981 ground breaking ceremonies were held for the new Church. The first informal service in the new Church was a "Service of the New Light" at 10:00 p.m. on March 18, 1983. The first family service was at 9:30 a.m. on March 20, preceding the dedication and consecration service at 6:00 p.m. There are 13 buildings, four residences, a swimming pool and other recreational facilities on the property. Today the Parish of St. Matthew consists of over 1700 baptized members and around 900 confirmed communicants. There are over 300 children enrolled in St. Matthew's Parish Day School and Preschool, plus additional ones in the Parent/Toddler programs.